Last month, we told you about an alleged Vaio smartphone that's supposed to be announced on March 12. Now, it's been discovered that the handset, model number VA-10J, was approved by Japanese authorities back in December - which seemingly means that it can already be commercialized in Japan. The VA-10J smartphone isn't a high-end one. Its features reportedly include a 5-inch 720p display, a quad-core Qualcomm Snapdragon 410 processor, a 13 MP rear camera, and a 5 MP front-facing camera. There are also 2 GB of RAM and 16 GB of internal memory, while Android 5.0 Lollipop is available out of the box. Speaking of the box, Vaio officials recently showed off the retail packaging of the VA-10J - you can see it in the slideshow below. Unfortunately, the smartphone itself hasn't been revealed yet. As you may know, Vaio is no longer a Sony brand. In early 2014, Sony sold the unit to a Japanese investment firm, thus Vaio became a standalone company. 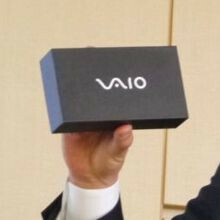 Most likely, the first Vaio smartphone will be sold only in Japan. But we'll let you know more about this as soon as new details are available. interested to see what it brings out. They said that they won't. Wow an article about a retail box! Better than overshared S6 news. Quite interested to see what comes out. Hoping a Vaio-like design language carried from their laptops (the recently released ones). based on the retail box volume rocker is on the right side design rounded corners ala xperia E4 design? Boooooooooo!! Show the phone! Id be less annoyed if it was a pretty asian girl holding the box. Probably the way around. They knew Vaio would be great standing on its own with its new family. Sony should've used the vaio name a long time ago for their windows phones. But they didn't want to share with ericsson. Thats why just as sony was on its own you saw more and more of their technologies come into the phones. I hate to say it but it could be to little to late. They should'be dropped the disastrous Xperia name (no matter how great the Z3 was it was plagued by the bad name of it's predecessors) altogether and went with VAIO. Selling the VAIO unit didn't make them any money. Heck they even lost money meanwhile losing a worthy brand. As you said, major wasted opportunity. this has nothing to do with the original vaio. still, that logo is tempting. much better than some funny rotten apple.